Nancy Naomi Carlson was born in Brooklyn, New York and was educated at Queens College. She earned her Ph.D. at the University of Maryland. Her poems have appeared in a number of literary journals, includingChelsea, The Greensboro Review, Poetry, Prairie Schooner,Shenandoah, and The Southern Review, and translations have been published in Colorado Review, Crazyhorse, Denver Quarterly, Southern Humanities Review, and are forthcoming in Circumference, The Marlboro Review, Puerto del Sol, and West Branch. 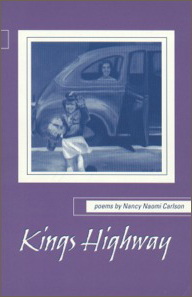 Nancy’s collection of poetry,Kings Highway, was a co-winner for the Washington Writers’ Publishing House competition, and Complications of the Heart won the 2002 Texas Review Press’ Robert Phillips Poetry Chapbook Prize. Imperfect Seal of Lips was the winner of the 2005 Tennessee Chapbook prize. Nominated five times for a Pushcart prize, she is currently an associate editor for Tupelo Press and an instructor at the Bethesda Writer’s Center. that take on a familiar slant. ride the curves of inflection. words appear before they are spoken. with an instinct to survive. transposed to fit any key. Kings Highway is freighted with loss, though loss is the poet’s route to understanding and acceptance. Poems here reiterate and expand on this theme. At their center, literally and metaphorically, is breath, as in the acute attentiveness to a newborn’s giving breath up, to a drowned baby’s breath “resurfacing,” to a starling “still formed, it looked asleep,” to a violin’s breath rising from the “rosined bow! against each string.” These are poems attuned to the subtle motions of grief and love that give need to words in the first place.